65th Anniversary for the N.A.C. Calling ALL N.A.C. 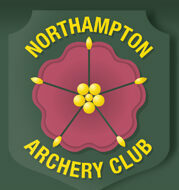 members, new or old,.…………………… anyone who has ever been part of the Northampton Archery Club since our conception during 1948 until the present day. We would like all of you to come to our Christmas party this Saturday evening at our Moulton College venue to help us celebrate 65 years of being a club. We have invited all old members and new members that we can recall but we may have missed someone. So if you know anyone who has ever been a member over the years please invite them on our behalf. We are partying at John Ashby Hall, Moulton College (gate 2) .on Saturday evening. There will be food available as well as a bar, from 19.30 till Midnight. So put this in your diary, you can even bring a friend if you wish. If you require further details then Ring Pam (chairlady) on 07757290717 or a committee member who’s numbers appear within these pages.